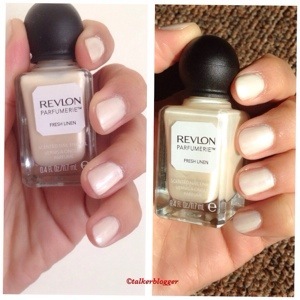 I am trying to be a bit lazy and combine two polishes in a single post .. Hope you will like what I chose to share ..
First up is the Revlon Parfumerie Collection member Fresh Linen, a pearl white polish that smells of laundry. Out of all those I smelt from this collection this one is most pleasing and subtle. The scent doesn’t stay on forever, mine was gone the next morning ! 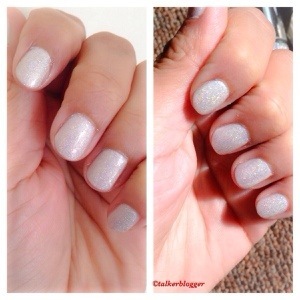 And finally: A comparison of the polish in shade and direct sun .. OVERALL: The Revlon is a great pearl white and if you don’t have this color in your collection this might me a good choice to go for. The Nails Electric Lane ( costs $10), it’s a great glitter coat over any polish for effects. I like it more than the Oh Zone! (Costs $12.50) because it carries a much more depth. I have however seen a similar polish in Ulta by China Glaze and it costs a lot less, plus it comes in a mini pack too… I have not used it but it looks similar.. So it’s not the rarest polish out there, but it’s a good one to own, great formula, easy application .. And who can ever have too much sparkles ..?